The deep red field is interrupted by two columns, each with a ewer placed upside-down at the base. 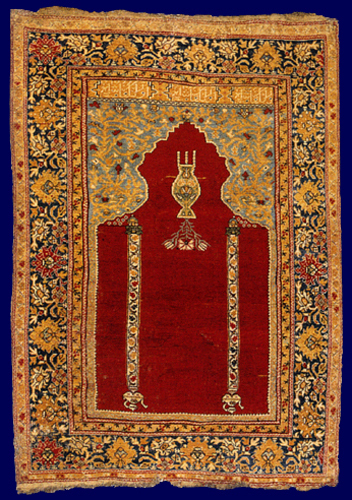 In the mihrab is a hanging lamp or vase, with three short chains; from the lamp emerges a stem with a carnation and two tulip-like buds that point downwards, in the direction the rug was made. As with the previous example (exhib no. 36), the spandrels are joined by a stem, as if to create a second, underlying field. In the panel above the spandrels are three cartouches with stylised Kufic script.